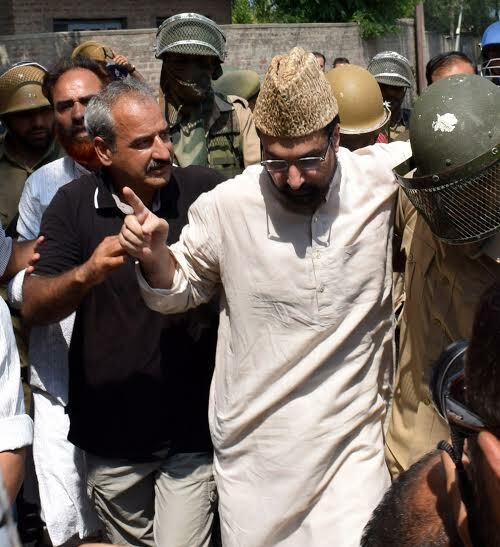 Mirwaiz Umar Farooq being arrested. Kashmiri militant commander, represents the fifth generation of Kashmiris since 1931, who are fighting for their basic human right – the right to determine their political will. Today it is 85 years since July 13,1931 when Kashmiris rose in rebellion against an oppressive occupation and 24 Kashmiris were killed in firing by the forces of the Dogra autocratic ruler. Since then it has been a painful saga of subjugation, oppression, misery by the people of Jammu and Kashmir. But it has also been a glorious reflection of the their courage, fortitude, resistance, resilience and repeated resurgence in the face of oppression. It has been the triumph of the indomitable human spirit of people here to seek freedom and the right to determine their political and everyday fate. How ironical is it that on a day when Mr Modi in South Africa boarded the same train in which Gandhiji had once journeyed and was moved and inspired to fight for India’s freedom, his regime mowed down scores of young civilian protestors with their guns in Kashmir. These civilians were demanding the same right to freedom that Gandhiji had felt in the racism and oppression of that train. Aren’t these double standards practiced, we ask, by the world’s largest democracy that it sought freedom from the British when it was a subjugated land and people itself and now it not only denies us that very freedom in Kashmir but even refuses the acknowledge our yearning for independence because it is the subjugator this time. I here want to directly address the people of India. For the sake of humanity, justice, peace and progress in the region, people of India need to know and understand the truth of Kashmir and play their role to end our subjugation. The aggressive posturing and approach of the Indian government with regard to Kashmiri people and its disputed nature has greatly led to the deteriorating situation here and can lead to catastrophic consequences for the whole region. The propaganda that they are constantly promoting through certain print and electronic media is that Jammu and Kashmir is an integral part of India, that it is like any other state of India and that the people of Kashmir consider themselves Indian, and there are few fringe elements creating “trouble” at the behest of a neighboring country. It is a lie. They substantiate this argument by saying that a certain percentage of people participate in electoral process by voting and exercising their choice. While it is a fact that certain percentage does vote to elect a governing body, it is only for the administrative purposes and for basic infrastructural facilities and amenities. It has no bearing on the disputed nature of the place and this is where the distinction needs to be made and understood. Even the pro-India parties here don’t dispute this truth. I want to remind the people of India that we have tried our level best to resolve this dispute with the Indian State through dialogue. And recent history is testament that New Delhi and not we thwarted such efforts. We were always and shall always remain ready to come to the table if your government is seriously willing to talk resolution based on the principles of justice and not surrender. There isn’t anybody more interested and willing than Kashmiris to permanently end this conflict and live in peace. The Indian State’s definition of peace in Kashmir isn’t acceptable to us. It is surrender. The current regime’s agenda has transcended the programmes to maintain and ensure status quo as a solution. Instead of listening to our genuine political demands, their only response is to use military force to kill us. They want to change our demography and are turning this political issue into a question of our very existence as people. The state of J&K as it existed on 14th of August 1947 is a disputed territory, recognized by the UN, India and Pakistan, who are the other two parties to the dispute. The main stakeholders, however, are the people of this land, who have as yet not been granted their right to determine their political will. It is for the achievement of this basic right that the struggle and suffering continues since 1931. It is for this right that over one lakh Kashmiris have laid down their lives. The baton of freedom has passed on to our fifth generation. For us, it is a moment of great pride and great pain as we witness our next generation joining the journey of freedom and sacrificing their lives. Which nation wouldn’t? I want to ask those, who call these young idealists “terrorists” that in which terrorist’s funeral will you witness hundreds and thousands of men, women and children participating that too defying restrictions, risking their lives and ready to face bullets. I want to ask what do you say to the sentiment that makes our youth so daring that they pelt stones when they know that they will be retaliated with bullets and be killed and yet they fight on again and again. I ask the people of India to wake up to the reality of Kashmir and understand that the issue needs to be resolved. The longing for freedom in Kashmir will not die its own death, as some would want Indian people to believe. History of freedom struggles world over bears witness to it.